Imagine assembling a 3D airline seat the size of a gumdrop. But instead of shiny plastic parts that snap together, you get an X-Acto knife, tweezers and photos of a real seat. Material? Printed manila folder. You have 8 hours. Go. If you’re Luca Iaconi-Stewart of San Francisco, no sweat. He’s done it literally hundreds of times, making the 2 incredible scale-model aircraft he’s built entirely of manila folders, glue and paint. The first is a 1:60 scale Air India Boeing 777-300ER he started in 2008, the year the long-range plane debuted. 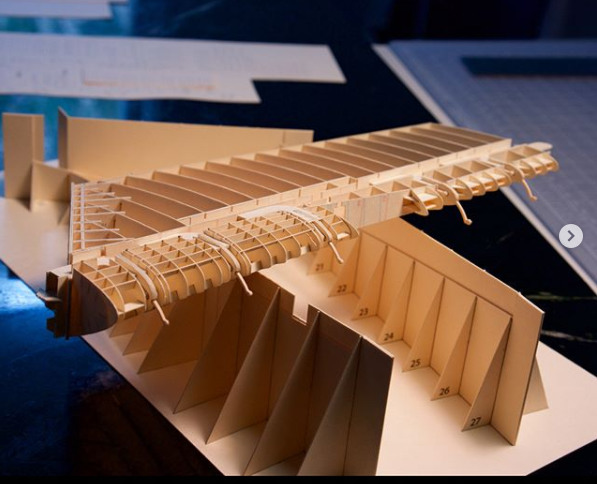 He was a junior in high school, inspired by the manila folder “massing model” he’d made in an architecture class. Manila folders have been his medium ever since. Lacking engineering drawings, Luca carefully studied photographs to reduce the 242-foot plane down to 4 feet – and every other piece down proportionately. He found an Air India seat schematic and eventually a maintenance manual online, which helped as he designed his own plans and printed them directly on the manila. Eventually, the 4 first class seats averaged 8 hours each, 35 business class seats 6 hours each and 303 economy seats just 20 minutes each. As skills improved, he ripped out and reconstructed bits, parts and whole sections of the plane to his liking. He rebuilt the tail 3 times. There’s more than enough material in his “plane crash” box of manilla discards to accurately say Luca has built 2 whole 777s. After high school, he studied political science for 2 years at Vassar, but recognized that wasn’t the right path. He came home, where he remains grateful to supportive parents. And he kept going on the 777. Then, after some 10,000 hours, Singapore Airlines called. 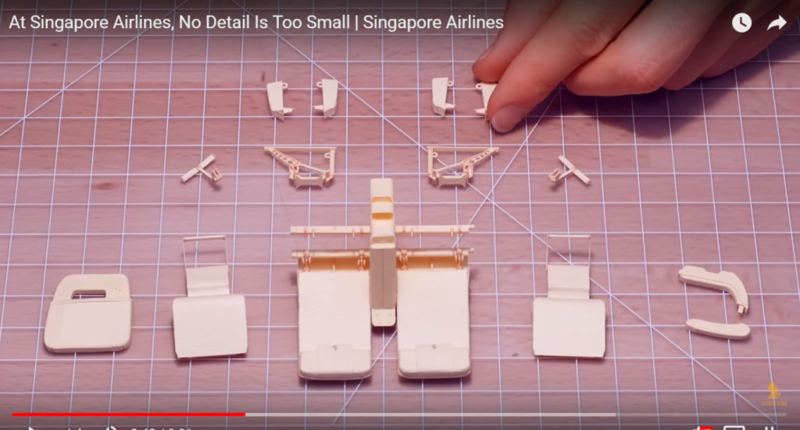 The biggest challenge – the wings – was still left, but Luca took a breather from the 777 to create a complete Airbus 380 for the airlines’ brilliant “No Detail is Too Small” campaign. That 2015 project famously took 1 bottle of glue, 50 X-Acto blades, 750 hours – and 3,000 pieces made from 100 manila folders. The A380 done, he shifted focus back to finish the 777. It took 2 more years until he could say, with all 30,000 pieces in place, that the project was, if not done, ready to paint. The dazzling precision of the paint job, seen here in time-lapse, shows the patience, stamina, focus and oft-times breath control required by this paper project. It’s easy to vastly underestimate its complexity, and with some parts literally the size of a pinhead, even Luca admits the project is crazy. He’s just grateful he was given the time – 10 years, on and off, with concurrent work and studies – and opportunity to do it. Luca believes paper can serve an incredible number of roles with limitless options. From bolts and hinges to toilet paper and tire tread, from service carts to overhead bins to bits that even the pilot and crew never see, the Boeing 777 model is all to spec. According to a Boeing pilot, the GE90-115B engine is “amazingly accurate.”2 Retractable landing gear and working thrust reversers are just a couple of the dozens of its working details; indeed, this paper airplane – 4’ long, 3.5’ wide and 1’ tall – is the stuff dreams are made of. For more photos and videos of Luca’s projects, check out his portfolio and pages on youtube & flickr. PS: What inspires Luca? A great many things, such as the paper art of Nguyen Ngoc Vu.